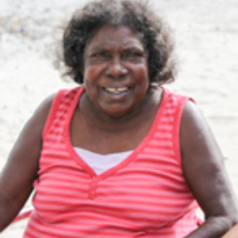 Laklak Burarrwanga is an Elder for the Datiwuy people (her father’s clan) and a caretaker for the Gumatj clan (her mother’s clan). She is the eldest sister and child in her family and has a special responsibility to care for her family, her Country and to help to educate people, especially non-Indigenous people. She has deep and profound knowledge of Yolŋu culture, ceremony and Yolŋu worldviews and is an important senior knowledge holder. She has many decades experience at sharing this knowledge with children through years of teaching in the community and at Bawaka. She established her family-owned tourism business Bawaka Cultural Experiences (BCE) and through this business she has taken advantage of being able to share her knowledge with tourists, including government staff in cross-cultural programs. She is an Honorary Associate of the Department of Environment and Geography at Macquarie University and has been working with academics from Macquarie University and the University of Newcastle for nearly 8 years. Her work educates non-Indigenous people about the existence and complexity of Yolŋu knowledge. Her work also explores the complex historical, cultural and political challenges Yolŋu have faced while bringing to life the strength and pride of the Yolŋu people. Her work is not only an invitation to learn but also an invitation for non-Indigenous and Indigenous people to reconcile and envisage a shared future.